Horton - Pérez Puyal, individual championship of Huesca Province, 2009, round five, position after 18.Rc1-c2. Play now proceeded 18...Rfc8 19.Rac1 Be8 20.g4 Nd6 21.Qf3 Nd7 and despite playing 22.Na4? (to which a knight capture on e5 might have been a strong reply) and some worse moves besides, White later went on to win. To my mind this is just about the easiest in the series, but it's one of those which are perhaps more interesting if you ask the question "if it's so easy why didn't the players see it?" Two different ways to win a piece or an exchange, an option to win just a pawn. Yes, definitely the easiest yet! 19. Bxf6 Bxf6 20. Nxd7 Rxd7 21. Nxd5 wins an exchange + pawn, at least. After 21. ... Rxc2 then White has the luxury of choosing between 22. Nxf6+ / 23. Nxd7, and 23. Nxb6, both of which look equally good to this human eye, unless Fritz finds some diabolical response? 19. Bxf6 Bxf6 20. Nxd5 appears just as good, with 21. Nxd7 or 21. Nxb6 to follow depending on the reply. It's probably only worth a pawn, though: 20. ... Rxc2 21. Nxb6 Rxe2 22. Bxe2 axb6. Black perhaps did spot the tactic, but too late, to judge from his move 20 (... Be8). Ah, OK, you're thinking of the same first move and then alternatives, rather than three different first moves! Yes, indeed, as long as I play 19.Bxf6 then it's party time. 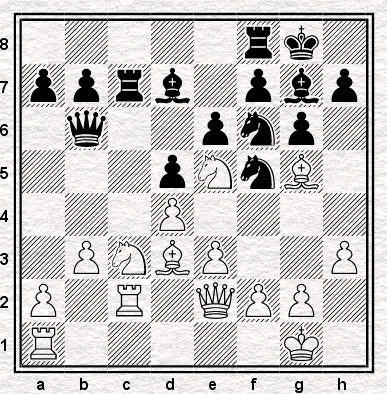 As it happens, I considered the capture on both the next two moves, when it doesn't win! But on the nineteenth move, despite all the pieces being obviously set up for a tactic (mind you, they were here too) I didn't. Because, perhaps, 18.Rc2 doesn't seem to do anything to strengthen White tactically and 18...Rfc8 obviously appears to reinforce Black on the c-file - whereas what it actually does in practice is to put a nice rook on c8 for White to take. Still, my tactical brain must have been at its dullest that morning anyway: if I tell you that the preceding moves were 16...Nd6-f5, 17.Bf4-g5 Rc8-c7, you can see another piece-winning opportunity sailed past unnoticed, and to my mind one that (perhaps unlike the nineteenth move) shouldn't be significantly harder to find OTB than in a puzzle.